Editor-in-Chief Rebecca Wilson met up with the masterminds behind ‘La Clandestina’, who bring the authentic taste of Mexico to diners in Bristol, with a social twist. Nidia and Nirvana were reminiscing about their home country over a beer when the realisation kicked in- that this one beer in England would buy you a whole meal in Mexico. They made a pact to save up beer money to send back to Mexico where it could feed those who needed it. Their focus was on the elderly of Mexico State. 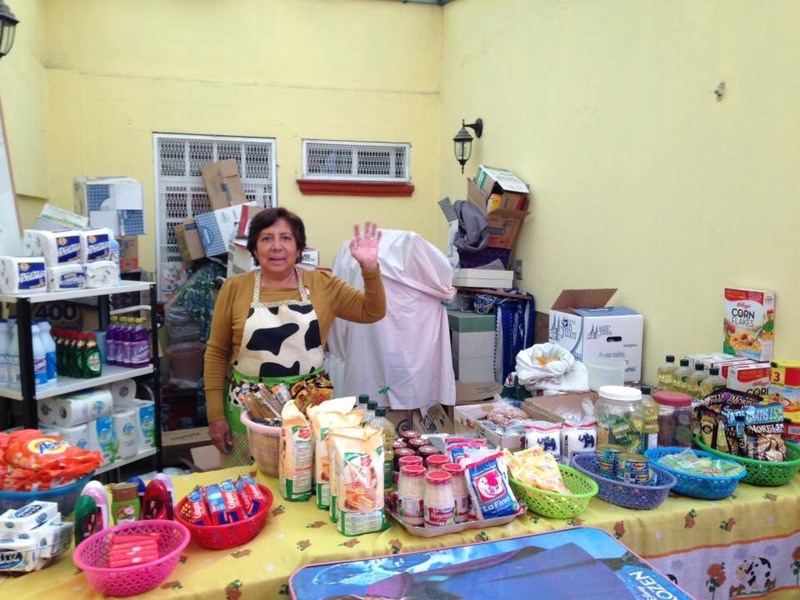 They started off by sending £50 at a time (what they put together from paychecks), and as it grew each month they managed to help “un viejito más”. Nirvana’s mother would take the funds to a store, buy staples and then sell them at a pop-up shop in their patio, at low prices to elderly members of their neglected municipality in Mexico State. As following grew, demand rose. They needed to acquire more funds. 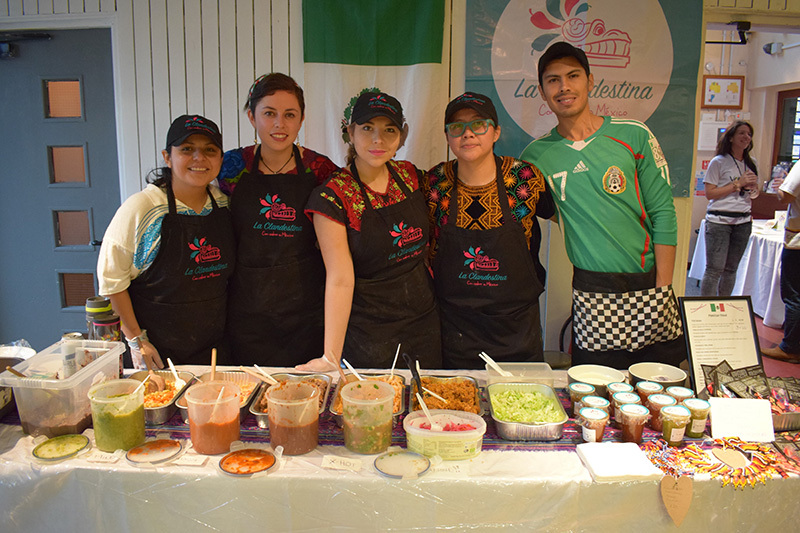 Keeping in line with their wish to nourish with Mexican flavours, they decided to begin ‘La Clandestina’: evenings of Mexican cuisine for their friends where everyone would donate what they could, fill up with delicious food and in turn give more Mexicans the chance to eat well and afford it. They began to double the funds and the elderly were able to buy around 60 basic ingredients and domestic products for the equivalent of a tenner. This includes beans, rice, oil and toilet paper, and the possibility of purchasing the products they really need rather than cheaper products processed with wheat and sugars which only exacerbate existing health issues such as diabetes. 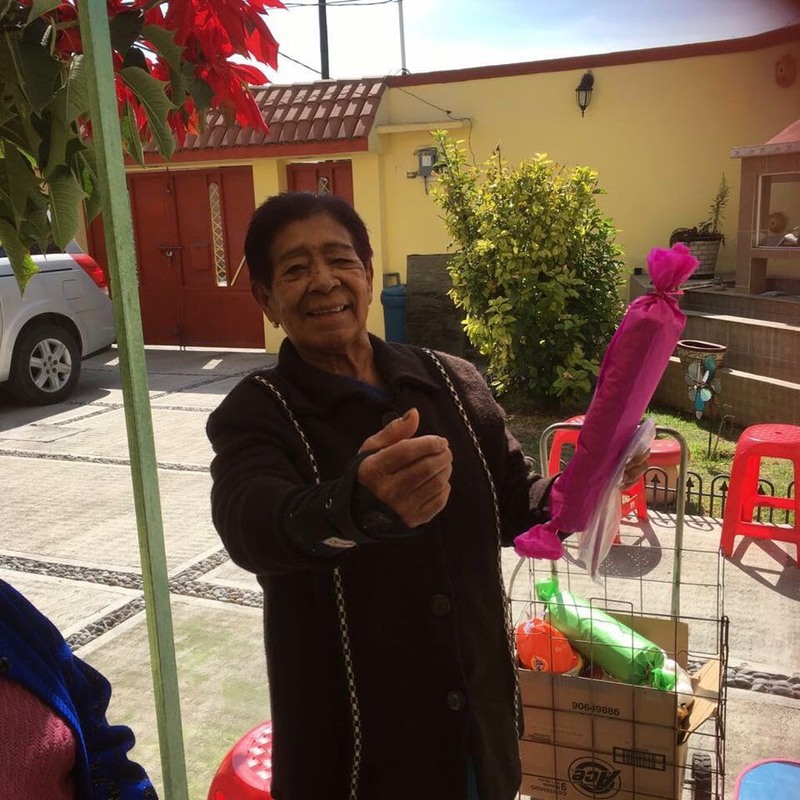 Many of the elderly in cities such as Coacalco and Tultitlan receive as little as £40 a month: much too little to eat well, let alone afford housing and healthcare. Many are forced to live in terrible conditions, collect rubbish or sell ice lollies in the streets to afford a tiny part of what they need to ‘comer decente’, to eat decently. La Clandestina began feeding Mexicans in Bristol who missed the flavours of their home. Nidia and Nirvana would bring over authentic spices and ingredients from Mexico which they then transformed into delicious meals, cooked with love, song and dance in their flat in Old Market. As word spread, they began to see Polish, German, Italian, Chinese, Taiwanese and Spanish diners among Bristolians and others from Bath. 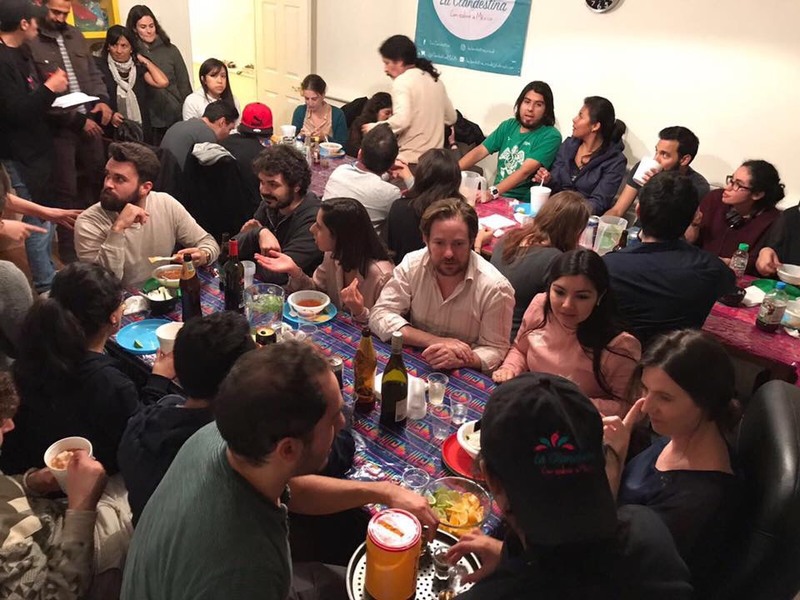 Friends and diners at La Clandestina’s recent pozole night in October. The sabor a México (taste of Mexico) is infused into all stages of the project. These flavours emanate from the ingredients with which the girls cook, season the recipes learnt from their abuelitas, and are relished by diners who then give back the resources to the grandmothers and fathers -the very abuelitos who inherited these concoctions- so that they can cook up those same delicious meals. The most recent dish was a pozole, a typical Mexican soup made with pork or chicken and a selection of fresh veg. The base of the red soup is made with tomato, chilli and the most common (and sacred) ingredient, maíz or corn. La Clandestina fed around 80 people that night. In the coming weeks it will feed many more. This is not aid. It is a sustainable way for modest people to continue to support themselves and uphold their traditions: buying and cooking what they need and enjoy, decently. 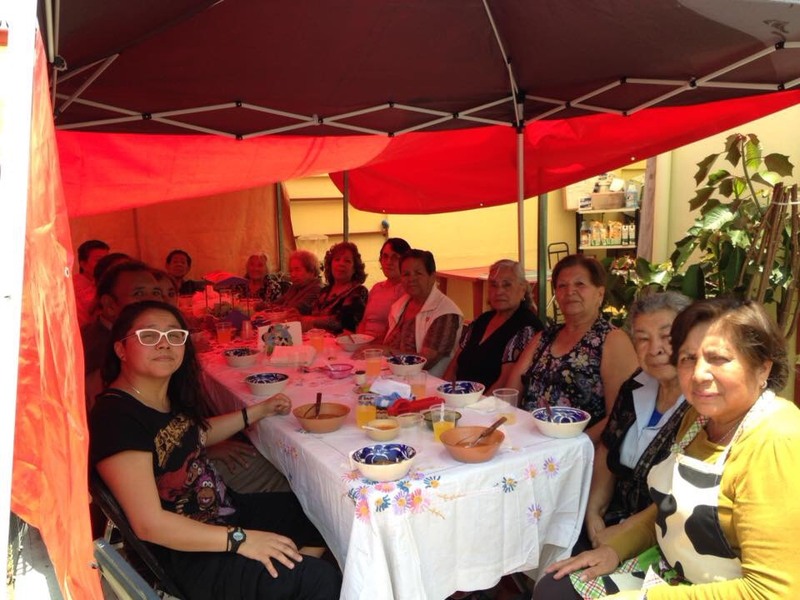 They have organised special meals for celebrations and días festivos, such as the upcoming Día de los Muertos, including raffles in which they offer donated bedding and orthopaedic products. However, the girls’ efforts do not stop here. Nidia’s full scholarship means she can afford to live and study Neuroscience here in Bristol, but also means she is reminded everyday of how lucky she is to receive help from the Mexican government, the same government which turns a blind eye to the poverty of many of its citizens on its native soil. Nirvana arrived in “what was once a Oaxacan city” the day after the tragic natural disaster. Provisions and livestock were brought to devastated neighbourhoods including that of many of her family members. Among many other Oaxacan communities, she saw that help is also needed in towns who were not directly hit by the earthquake, as their livelihoods depend on those towns which were. Having now returned, the pair have instigated ‘Reactivando a Mexico’, their current project which runs alongside La Clandestina, which is growing exponentially on both sides of the Atlantic. Nidia’s sister in Spain and Nirvana’s good friend in Mexico are part of the recent project, whose first initiative offers beautifully-designed bracelets with important and relevant Oaxacan notions woven into the fabric in Spanish and in the indigenous Zapotec language spoken in the area. This Friday 20th, in time for Día de los Muertos, La Clandestina will be contributing their sabor a México towards a kermés at Hamilton House, also featuring typical Mexican street party games, live music, and a raffle. All of La Clandestina’s proceeds (from food, fresh homemade salsas and the Zapotec bracelets) will go towards their Reactivando a México project. If you’d like to help Nidia and Nirvana with their projects, keep up to date with their dinner plans by following their Facebook page. 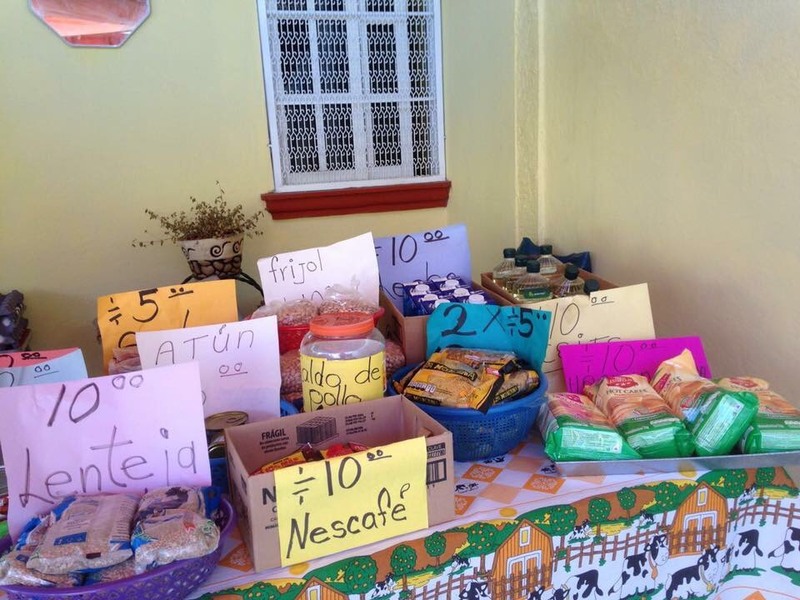 Lentils, beans, coffee, rice stock and tuna: everyday ingredients being sold at a pop-up shop in Mexico State. 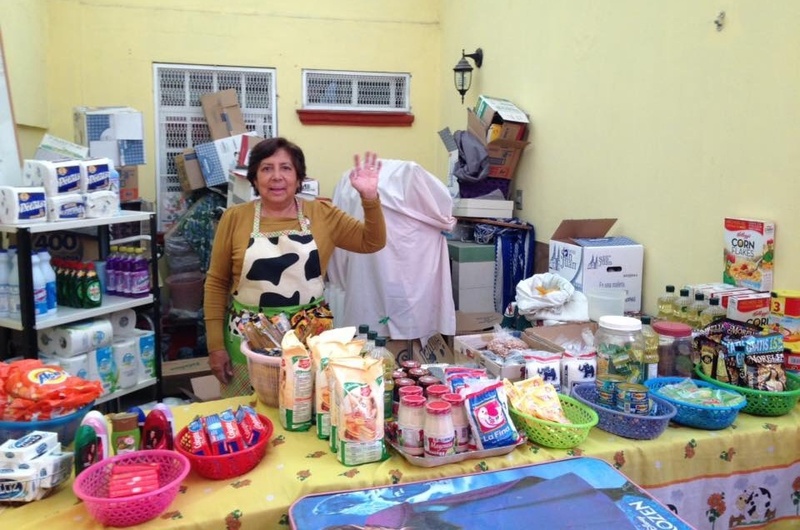 Nirvana’s mother selling food items and domestic products at discounted price from their patio in Tultitlan, Mexico State. Elderly members of the community shop for staple goods. La Clandestina have received donations such as orthopaedic arm braces. Revenue from the Bristol meals means the elderly can celebrate public and religious holidays with traditional food and enough of it to go around. All images from La Clandestina.